A former New York City and Nantucket restauranteur with a James Beard Award-winning cookbook is opening a new breakfast and lunch spot in Chestnut Hill. 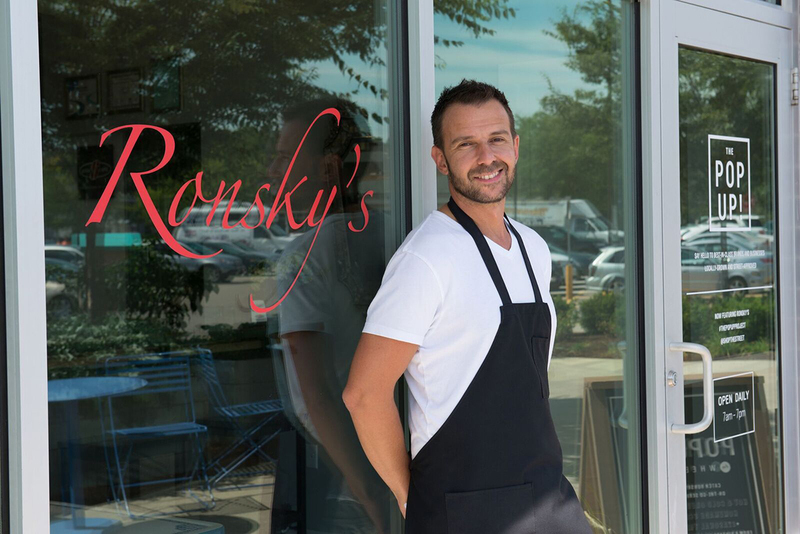 Ronsky’s Café debuts today, a three-month pop-up by chef Ron Suhanosky. Suhanosky cofounded Sfoglia, with locations on Nantucket and in Manhattan, in 1999, and was chef/owner at the two spots for a decade. His first cookbook, Pasta Sfoglia, co-written with then-wife Colleen Marnell-Suhanosky, won the Best New Cookbook nod in 2010. Marnell-Suhanosky now runs Rifrullo Café in Brookline. Suhanosky has also cooked at City’s River Café and Il Buco in New York City, and at Coppa. With Ronsky’s, the Street now has a spot for breakfast sandwiches, like egg, fontina and New England Charcuterie breakfast sausage on a black pepper biscuit, and there are other morning options like avocado toast, and Nonna’s zeppoli, a ricotta doughnut recipe from the chef’s family. At lunch, the menu offers panini like classic Italian, meatball, and a veggie choice with goat cheese. There will also be salads. The menu sources breads from Slow Rise in Concord, and produce from the Green City Growers beds located at the Chestnut Hill development, just outside the pop-up entrance. In addition to Italian espresso, Ronsky’s will offer house-made tonics, iced tea, and cold brew coffee. Along with select baked goods, those items will be available throughout the Street courtesy of a roving Ronsky’s coffee trike, too. The pop-up storefront has hosted a rotating lineup of local businesses, from OMG! Bagels to Kane’s Donuts to Rancatore’s Ice Cream. Ronsky’s will be the “most gourmet” yet, the Street promises. “To welcome a chef of Ron’s caliber, and see him create something so specific to our property is absolutely amazing,” says general manager Allison Yee. The 400-square foot storefront got a makeover to house the new café, with white tin ceiling tiles, harlequin floors, a splash of gold paint on the walls, and a communal table, which formerly sat in Suhanosky’s great grandmother’s kitchen. Ronsky’s is open daily from 7 a.m.-7 p.m., from Monday, September 12, through the end of 2016. 3 Boylston St., Chestnut Hill, 617-903-2159, thestreetchestnuthill.com.